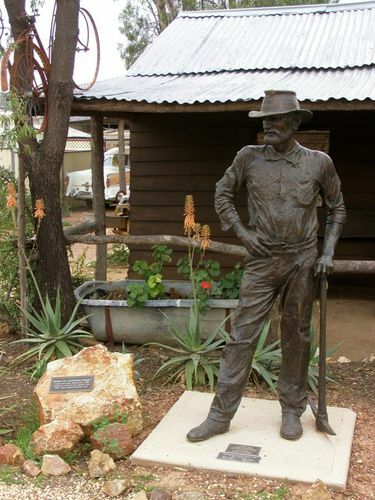 A life size bronze sculpture, the "Spirit of Lightning Ridge" commemorates Charlie Nettleton who sunk the first mine and founded the black opal industry at Lightning Ridge. The sculpture was commissioned by the Lightning Ridge Historical Society. Nettleton was at Mt Browne in the north-western part of the state prior to White Cliffs. In 1901, he walked towards Bathurst on the trail of gold. Near Wallangulla, he saw unusual, nodular black opal and the potential in it. A syndicate of local businessmen paid him to sink a shaft at McDonald’s Six Mile but it was unproductive. He was on his way to the Bathurst camp when he stopped. He walked from White Cliffs to Lightning Ridge where he was the first to dig a mine or put in a claim. In 1903 that he walked back to White Cliffs and sold a parcel of black opal to Ted Murphy, who later became the first resident opal buyer at the Ridge. Many White Cliffs miners followed their mate back to the new opal rush and Nettleton’s expertise earned him further respect. The 3-Mile village site was known as Nettleton, even after people moved into the surveyed ‘New Town’ at the beginning of World War One. The village was officially renamed Lightning Ridge in 1963.